As part of our tagging prevention programme we have commissioned a series of murals for under the road/rail bridge (at the entrance to Plimmerton) and in the rail underpass. Two beautiful murals titled bring back the birds were designed and painted by local children in the holidays during 2016. These murals support Pest-Free Plimmerton initiatives. Plimmerton residents’ Association has sponsored large pest traps for the outer perimeter of the area (the ‘ring of steel’) to the value of $5000. 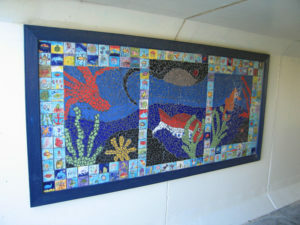 Another project illustrated by local children were installed in 2016 is the Taupo Plimmerton Heritage Trail. 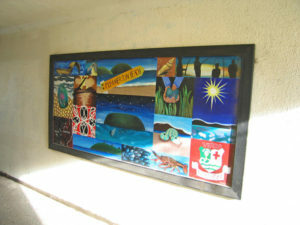 Two colourful murals were created by local children to promote the newly completed trail. Thanks to Rachel Benefield, local artist, who worked with the students involved to create these marvellous murals. And thanks to Porirua City Council and their village programme which enable PRA to fund these projects. 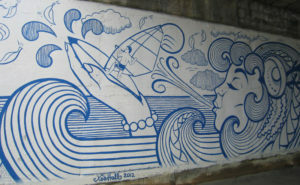 Two Plimmerton street scene murals were painted on the underside of the bridge by local artist Xoe Hall. 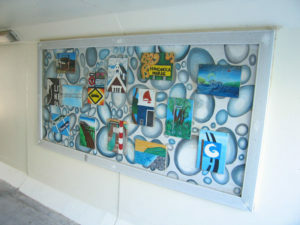 All these artworks have contributed to a more attractive environment here and have helped to keep these areas tag-free.